INDIAN OCEAN - Searching a combined 15,000 square miles since March 10, USS Kidd (DDG 100) and its MH-60R helicopters completed their search of the Andaman Sea and have been detached from the Malaysia Airlines flight MH370 search and rescue (SAR) effort as of March 18. No debris or wreckage associated with an aircraft was found. "The dedication of this crew is amazing," said Cmdr. T.J. Zerr, Kidd's executive officer. 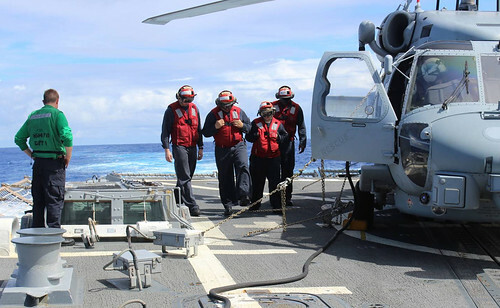 "314 Sailors were out here operating for 24 hours a day, standing extra watches and volunteering for extra duties because they knew if it were their loved one missing on MH370, they'd want the best U.S. Navy capabilities involved in the search." The move was made in consultation with the Government of Malaysia. 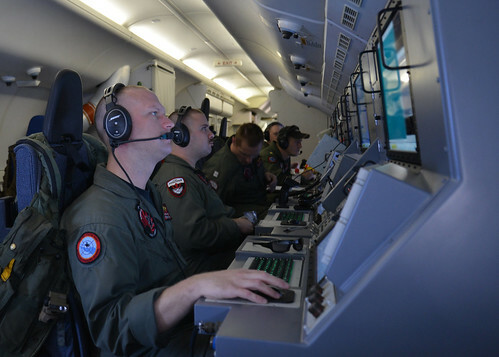 With the search area expanding into the southern Indian Ocean, long range patrol aircraft such as the P-8A Poseidon and P-3C Orion are more suited to the current SAR mission. Covering up to 15,000 square miles in one 9-hour flight, the P-8 and P-3 can search larger areas with their advanced surface search radars and electro-optical sensors as well as fly low for visual identification when needed. "I'm proud of our crew and their performance and resiliency during this challenging mission," said Cmdr. Gabe Varela, Kidd's commanding officer. "We trained for operations like this throughout the year and when it was time to execute this crew came though flawlessly." USS Kidd will proceed south through the Strait of Malacca to the South China Sea for follow-on operational tasking as they were when the search operation started. The US Navy will move its P-8 Poseidon to Western Australia to better support the expanding SAR efforts to the South.